Budget airline Ryanair is to fly to 13 new destinations from Bristol International Airport. The Irish carrier said it would buy two planes for about £70m to fly out of the West Country, mainly to destinations in eastern Europe. 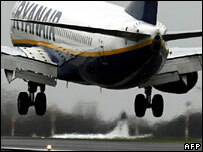 Flights will start in November, with two million passengers expected to fly with the company by 2009, Ryanair said. CEO Michael O'Leary said: "This base will deliver a fivefold increase in our passenger numbers at Bristol." The new destinations are Bratislava, Budapest, Derry, Dinard, Katowice, Knock, Milan, Porto, Poznan, Riga, Rzeszow, Salzburg and Wroclaw. A local campaign group condemned the new routes as "bad news" for the environment. A spokesperson for the Stop Bristol Airport Expansion campaign said that the new flights would encourage more short breaks away, taking money away from the local economy. They added that the increase in flights would be a backwards step in the fight against climate change.